You might remember the Jawbone UP. It is a fitness tracker that stands out from the rest not just with an awesome design, but also with the fact that it tracks your activity during sleep, not just daytime. It launched nearly a year ago, but was pulled shortly as there were faulty units and users complained. The Jawbone UP wristband went back to the engineering and testing lab, and finally after graduating 3 million hours of testing, it is back. It works with an iPhone companion app, and is a general health and fitness tool. It tracks your steps during the day, monitors your sleep and the tiny motions during your sleep and even allows you to snap pictures of your daily meal to better understand your eating habits. The iPhone app then analyzes all of that data showing you the periods of light and deep sleep, and wakes you up at a point where there is no crude interruption of your sleep and you feel fully refreshed. During the day, the UP tracks times when you are active and idle, and not just that but tells you how intense your activity was. Calories burned and distance travelled are also calculated. The wristband itself is made out of medical-grade rubber and it is splashproof (but not waterproof). It last around ten hours on a single charge. 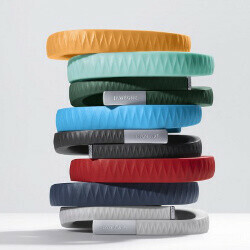 At launch, the Jawbone up will come in eight colors and three sizes. The release date is today and you can buy it for $129.99 from Apple, AT&T, and Best Buy. The battery lasts ten days not ten hours. Good luck if this one doesn't work! I was an original adopter of the first UP buying it from the company pre-release. It took me 10 MONTHS and multiple broken "4 to 6 week and you will get your refund" promises to finally get my refund. I opted for the store credit but what they did not tell me was that the credit was, "...One-time use credit good for only one transaction. Unused portion of credit will be forfeited. Valid for 6 months. Excludes limited edition and other selected products.Cannot be combined with other offers or promotions." So while any Joe can now get $50 off a Jambox, not me, and I bought the original UP pre-release from the company. Buyer beware! You might want to wait a year to see if it really works and then buy from a big store with a strong return policy so if it breaks you will not have to deal with Jawbone directly.